The HypnoBirthing classroom (3-10 couples) program includes (5) 3 hour weekly sessions. 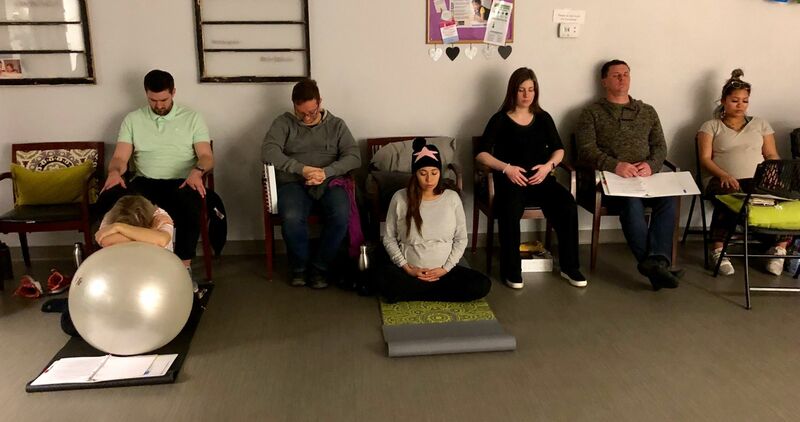 The fee for the classroom program is $285 which covers the entire program for mother and birth companion: all sessions/classes, the textbook “HypnoBirthing – A Celebration of Life, 4th edition” by Marie Mongan, audio downloads for relaxation practice, and class binder. An $85 non-refundable deposit is required, due before attending the first class, with the balance ($200) due at the end of class one. Class enrollment is on a first pay, first reserve basis. Sign up early to save your spot! Private Instruction is offered for families with rigorous schedules or who are fast approaching their due dates. Please contact us at 702.385.3331 or info@hypnobirthinglasvegas.com for availability and pricing. Class Deposit ($85 non-refundable); ($100 non-refundable for private sessions). This deposit reserves your space for a group class and allows HypnoBirthing Las Vegas to purchase your class materials. For private sessions, this non-refundable deposit books your appointment and covers the first hour of your instruction. The deposit may be paid by credit/debit card through our online store or by making a check or money order payable to: HypnoBirthing Las Vegas (please contact us for the mailing address and to notify us that you will be making your payment via USPS; not responsible for lost or stolen checks). To view the entire fee schedule click here. HypnoBirthing Las Vegas is committed to providing you with the best quality classes. Since organizing these classes takes time and class materials are purchased ahead of time, we do not offer refunds. If for some reason you are unable to take the class for which you enrolled, we may apply your credit to another class series start date only. If for some reason you are unable to take the class and do not wish to enroll in another class or date, you may transfer your credit to another person, as long as they have a copy of your receipt.